This is Mr. Egg. Mr. Egg was purchased, along with 11 other Mr. Eggs, for about $2. I have eaten the other 11 Mr. Eggs, and I would have eaten the last Mr. Egg this morning, but I decided not to. As you can see, there is a little hole at the top of Mr. Egg. The Mr. Eggs that I purchase usually do not have holes at the top. 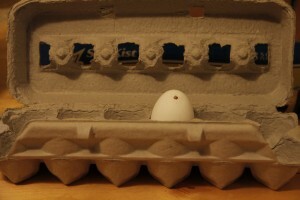 In fact, the reason I purchase these Mr. Eggs is because I want them to not have holes at the top. Holes at the top of a Mr. Egg mean that Mr. Egg is still alive. Yes, Mr. Egg was still alive sometime between November 20th November 29th. Mr. Egg must have tried to escape the frigid temperature of my refrigerator. But, to Mr. Egg’s dismay, my fridge is much too frigid for any escape. Mr. Egg fell victim to the harsh temperatures because he poked a hole in the top of the egg with his beak. Mr. Egg should have waited in the warmth of the egg. Maybe, then, Mr. Egg could have escaped as I cracked open Mr. Egg to pour him into the scalding warmth of my skillet. I will not dispose of Mr. Egg. I might keep him as a souvenir. Or as a reminder to other Mr. Eggs that they should be dead when I buy them. Thankfully, we can take comfort in knowing that Mr. Egg died in the company of his dead brothers. I’m not satisfied with this blog. I pay $60 a year so I can have a hipster domain name and so I can have a rotating banner at the top of every page. I can probably get all this for less than $60 a year, but I still choose to spend $60 a year. Something I’ve learned about myself this semester is that I am a very inconsistent person. I’ve always been inconsistent. I may shine in my times of consistency, but those shinings are short-lived. At this blog, though I have so many posts in draft, I am very inconsistent in publishing. Therefore, in addition to being more consistent in blogging at this blog, I intend to reconsider and reshape the content of this blog. I like to blog at my Tumblr because it’s cute, short, and, generally, more artistic than my drawn out contemplative appeals here. Therefore, I will look to make this blog cuter, shorter, and, generally, more artistic than it is now. I think I might achieve this by sharing some of my artistic endeavors, and by blogging less dense thoughts. This would include collections of images, commentary on some videos I’ve made, further insight into my interests, and maybe some vlogs. I intend to add some sort of theme and some sorts of strong content by 2010’s end. As a symbol of my new intentions, and to serve as a reminder of my inconsistent tendencies, please accept and revel in this image of me. It is dated circa 2008-2009. 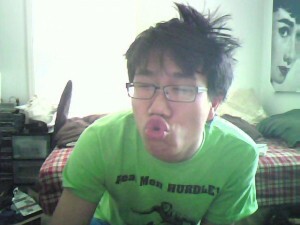 I had just awoken from a nap, and I was captured at the fantastic and bossy form that my hair took. I import this blog to Facebook. If I become more consistent in blogging, I will spam Facebook with my notes. Oh well. C’est la vie.